Child: Daddy, what can you eat, but not for dinner? Child: What can be served, but not eaten? Child: What city has no people in it? We have been having many day trips to visit various parts of New Zealand and we try to find learning opportunities in them. We learn about birds, habitat, electricity, fluid mechanics. Fun stuff. Then, while driving by one of the numerous paddocks where cows are grazing, we hear a squawk of delight from the back. Luckily for us parents, we haven’t started the Life Cycle of the Cow lesson yet. The kids are excited for my wife to come home in the morning after working a night shift. They want her to make them breakfast as they all hang around for an hour of social time. As with most of us, some mornings are less perfect than others for my kids. And sometimes parents don’t have the emotional fortitude to not react. Child: This crepe tastes weird. Father to ungrateful child: You know what it tastes like? It tastes like the last crepe Mama will make for you. As I’m setting up the blog again after a few years of, well, life, I noticed that the top three topics have been: Alcohol, Housekeeping, and Tantrums. Coincidence? While preparing, I flash back to a memory from sixteen years ago. I had recently quit my job in manufacturing and was spending a year in the Pacific Northwest. Part of the reason I left was that I was burnt out working on the manufacturing floor; equipment breaks and I would get called in to fix it. Sometimes I’d end up being late on other assignments and get grief for that, and sometimes I’d be called at night or on weekends – whenever the plant was running was fair game. I hadn’t planned to go back to being an engineer, especially in manufacturing, and thought maybe I’d do something like volunteer teaching or tutoring. I contacted the local high school and offered to help, saying that my strong point was math. I envisioned helping some kid by ‘turning the light on’ in a given topic, where they’d finally understand something that confused them and they’d be happier and more confident. The school said they’d call when they needed me, and it didn’t take long. I got a call from the school with an odd request – their shop class had a small desktop robot. The robot had broken and no one knew how to fix it. Could I come in and see what I could do? I visit the shop class and it’s a pretty cool shop. I had to admit that I did feel at home here. I get to work and fix the robot. Then, just for fun, I program it. I make a little material handling routine that picks up blocks from one area and organizes them on the other side. Students come by to check it out. I told the shop teacher I could come back tomorrow and he says yes. The next day I created an obstacle course and students got to learn how to program the robot to complete the course. On the third and final day, I take a few freshmen to the chalkboard to explain how some of the mechanics work – how rotary motions can be made into linear motion and why that’s important. I start drawing lines and writing basic linear equations and explaining them. I explain that making the robot work is WHY we learn things like linear equations – it’s not just meaningless busy work. I was on a roll. So I turned around and went back to finish the explanation. As I wrote that last “y = mx + b” on the board, I started to remember what I had loved about my job, what inspired me. There is some pretty cool stuff that can be done with math, with engineering, and with manufacturing; stuff so cool that a bunch of fourteen year olds would ask to stay after class to learn linear equations. So here I am, sixteen years later, planning lessons for my kids. I don’t know what subjects will spark their inspiration, but I hope they find it. And it is nice that I can be here, helping them look. There have been so many stories to tell since our journey began that I have struggled putting enough words to any single one of them. More so has been the challenge to find a good ‘first’ story, one that kicks off appropriately this Year of Living Sequeiralously. Many have come close – the (almost) $400 sandwich and the two pounds of meat I slow roasted (in the minivan at the airport parking lot during the week long heat wave) come to the forefront. But just now, after Mick left for an evening shift after spending the whole day with us, as the low winter sun streams into the kitchen from the north (north?) west, and I’m watching the kids playing in their shorts out on the trampoline that came with the house we rented from a family of 6 who are on their own adventure, listening to Dino nice and loud, simmering some curry and rice for dinner, I realized that the epic story is that the five of us went through months of separation and moves and emerged together just wonderfully. Epic is in the everyday, and so begins the Year of Living Sequeiralously. Got the stretch washed for the first time in years. 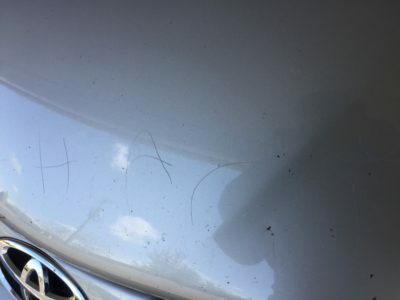 We can now see clearly the writing etched with a stick in the hood. Someday soon my child, whose name begins with H A R, as shown in Exhibit A, will get smart and write something other than his name, and then we are in big trouble. …so one of my other kids didn’t want to be outdone apparently. Last weekend I was at our house mowing the lawn and keeping up the yard so it looks nice for showing (we are selling it). Said child has to do some business so I take him inside to one of the pristine bathrooms and get back to yard work. Today I am back to clear out some remaining items and I go downstairs to do my periodic check and smell poop. I worry something went awry with the plumbing! I was both relieved and irritated to discover that said child forgot to flush down his nasty (NASTY) colon cleansing.